You don’t have to be a certified nutritionist to realize that ground turkey is healthier than beef. Just try washing ground beef sludge off your hands after molding it. It takes 5 minutes to get clean. But turkey rinses away almost instantly. I created this recipe while in Denver visiting my brother, who has a heart condition and eats healthy. The caramelized onion makes these burgers. The curry powder is just enough to give it a richer savory flavor, and not enough to overpower. 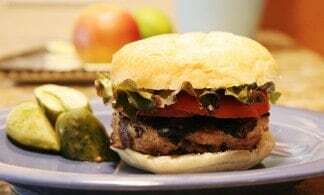 We ate them as mini meatloaves with baby roasted potatoes and roasted veggies on the side, but you can build your standard burger sandwich with them just fine. This article is submitted by long standing Copykat.com member, Jacki Schklar. Jacki is a Video and Interactive Content Producer in Atlanta, Georgia. She is also publisher of Funnynotslutty.com, which features comedy for women created by female writers, producers and comedians. 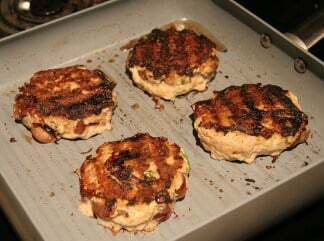 Turkey burgers are a great lower fat alternative to ground beef. The caramelized onions on this burger makes them taste amazing. 1 red onion sliced in rings and then half. To caramelize onion, sauté in pan with the olive oil over medium/low heat for about 15 minutes until glossy and soft, almost burned. Stir about once a minute. You will need to watch constantly to keep from actually burning. Set aside to cool a little before adding to meat mixture.Mix remaining ingredients with the turkey and then combine the onion. Form into patties.Grill or cook in skillet with a few drops of olive oil, until center is cooked through. Well done is best. The Copykat Taco Seasoning Mix makes great tacos when with ground turkey breast. I add a pinch of oregano to the mix. Ground Turkey Breast is less gamey tasting. I use that most of the time. The 94% lean may be a good choice for meatloaf or meatballs, but in chili or spaghetti sauce it’s too strong tasting and overpowers your recipe. 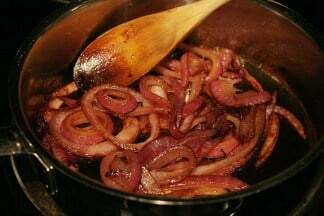 Use the breast meat for those sauces and soups. Make a yummy turkey sausage that is perfect with pancakes. Add a generous amount of one of the Penzeys Spices sausage blends to meat and make into small patties and fry in a pan with a few drops of olive oil. I use Penzeys’ Kakrow Nights blend for this. I like to cook with turkey for my family because it’s so much more healthy than ground meat. The Caramelized red onions made the burger this was so good!